The anti-tumor effects of cannabinoids and THC have been demonstrated for quite some time now. In the 1980's, cannabinoid receptors were discovered in the human brain, which made it obvious that our body has to synthesize something that binds to these receptors. Our bodies produce these compounds in our own endocannabinoid system, which is now known to be responsible for a number of biological functions. This is why the plant has such a wide therapeutic potential for multiple diseases, including cancer. Numerous studies have demonstrated time and time again the anti-tumoral effects of cannabis. Studies have shown that cannabis completely kills cancer cells, and it has a great impact on rebuilding the immune system. Cannabis has the potential to replace a multitude of pharmaceutical drugs, and it remains a mystery as to why human trials are not under way. If you're looking for these studies, I've put multiple links within the article for you to further your research. In the United States, there are only two approved treatments for cancer, radiation and chemotherapy. Scientists have discovered that chemotherapy fuels cancer growth and kills the patient more quickly, yet nothing has been changed. Both are extremely toxic to the human body. Thanks to a growing awareness with regards to cannabis, and its high rate of success with individuals choosing to use it as a cancer treatment, more people are starting to realize the healing power of this plant. Coupled with all of the success stories, are hundreds of scientific studies that prove cannabis kills cancer, it's really becoming a no-brainer. Brave Mykala had T-cell acute lymphoblastic leukaemia, it's a very rare and aggressive form of childhood leukaemia. It accounts for 15-18% of childhood leukaemia cases. Her DNA was altered in someway, and it caused her bone marrow to start producing leukaemia white blood cells. She fell ill in may of 2012, and in July of 2012 doctors discovered a basketball sized mass of lymphoblasts in her chest. Her mass was so large that she was not able to be sedated for risk of death from the pressure on her esophagus and heart. Click on her name above to visit her website, click HERE to visit her Facebook page to stay up to date with everything that's going on with her. So far, cannabis has helped tremendously. For more CE articles on Cannabis and Cancer, click HERE. We also covered a story of a teenage girl that used cannabis to treat her leukaemia, doctors in Toronto published the case study. Click HERE to read more about that. This protocol is used to treat low risk leukemia patients (Mykayla is technically intermediate risk). It is a 3-5 chemotherapy drug and steroid combination that is done in 5 rounds lasting 2.5-3 years. The first 4 rounds are very intense and last for 6-8 months. The last round is called “maintenance”, it is done mainly from home and is far less damaging then the first 4 rounds. Mykayla will begin maintenance chemotherapy in February of 2013. Mykayla began chemotherapy on July 16th 2012 (she began steroid treatment on July 14th 2012). Mykayla's Lymphoblast level was monitored daily for the first 8 days and weekly or twice weekly thereafter. Her lymphoblast level would go down after receiving chemotherapy but a few days after it would be back up and sometimes higher than before chemotherapy. The doctors were concerned. They spoke to us about the possibility of Mykayla having a bone marrow transplant due to the leukemia not going into remission with the chemotherapy. 95% of children with leukemia go into remission during the first 30 days of chemotherapy… the majority of them go into remission just a few days after receiving chemotherapy for the first time. The oncologist did recommend cranial radiation in Mykayla's case as she is intermediate risk, t-cell phenotype, and had a very small amount of leukemia cells in her brain and spinal fluid. Using cranial radiation to treat leukemia is a topic that is already controversial between the different cancer research groups… our family felt 100% confident in denying cranial radiation for Mykayla as she is in remission (it was for prophylactic/preventative reasons that it was recommended) and she has natural treatment methods that protect her from cancer and relapse. 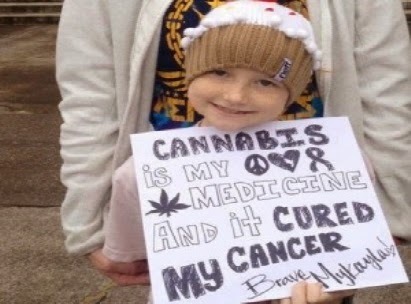 We had a plan from the very beginning to combat Mykayla's cancer and chemotherapy naturally and that was to use cannabis in the form of very concentrated and potent oil, raw cannabis juice, and cannabis cooked into food. Cannabis has been known to kill cancer, protect the body from the damage of chemotherapy, relieve pain and nausea, and it is a neuroprotectant and antioxidant. In order to use this form of treatment Mykayla had to get a recommendation from another physician and a state medical marijuana license. This took us 10 days to complete… Mykayla began cannabis therapy on July 24th 2012! Instantly she was able to eat again. That was the first benefit that we noticed. She was happier, she smiled and laughed constantly. We loved it! One week after we began the oil treatment Mykayla's physicians notified us that her leukemia had vanished from her bone marrow and blood! She was in remission. Never again will I fear cancer… We found the answer! Mykayla is currently 6 months into the intense treatment part and has never used any pain relievers (not even Tylenol) and has only had to take anti-nausea medication a few times. July 30th 2012 was THE VERY LAST TIME THEY HAVE FOUND LYMPHOBLASTS IN MYKAYLA'S BLOOD SMEAR!!!! The very next time we saw the oncologist they told us Mykayla was in remission. Some may say that cannabis does not “cure” cancer… I am not saying the steroids and chemo didn't help… but this right here shows something… proof enough for me! Some say cannabis is inappropriate for children… We say cancer is inappropriate for children.